2018 Murray Codference this weekend! Look at all the goodies you’ll receive on entry! 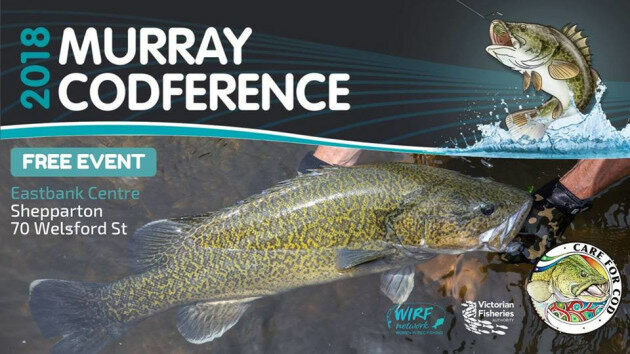 THE 2018 Murray Codference is on this weekend, Sunday December 9, and organisers say it’s going to be the biggest and best yet. Attendees will get a VFA backpack with a KuttaFurra “Ruthless Paddler” surface lure, a Care for Cod boat sticker, the Codference proceedings book as well as lots of native fish information. Not to mention the sensational speakers! Everyone who’s there on the day will also be eligible to win prize draws throughout the day – but you need to be there to win! We’re at over 700 registrations now, so spots are limited. If you haven’t booked yourself a FREE seat yet, you better do it now. Click HERE for tickets, or for further information, click HERE.